We are not hiring. We’re handpicking. Come help us change the conversation. "Curiosity about life in all of its aspects is still the secret of great creative." 1. THINK HOLISTICALLY. 2. REMEMBER YOUR GOAL. 3. BE EMPATHIC. 4. RESPECT YOUR PASSION. 5. DISAVOW “BORING.” 6. EMBRACE “I DON'T KNOW.” 7. NEVER BE SATISFIED. Artists. Scientists. Readers. Writers. Students. Teachers. Musicians. Jokesters. Gamers. Fashionistas. Odd balls. Brainstormers. Inventors. Problem Solvers. 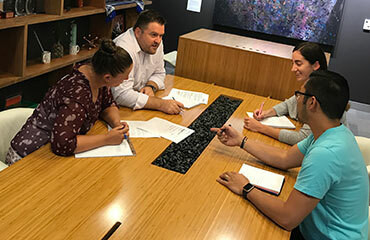 Our team receives an industry-leading total rewards package. Our walls are filled with distinctive art pieces and quotes from industry legends. It keeps us inspired. Throughout our office, we are hosting an exhibition of 23 pieces from 15 extraordinary artists – all with ties to the Greater Philadelphia region. The first exhibition is made possible through our partnership with CFEVA, the Center for Emerging Visual Artists. All works of art are for sale and may be viewed by appointment. All sales directly support the artists, CFVA and the regional arts community. IT'S NOT JUST A JOB. IT'S AN EXPERIENCE. 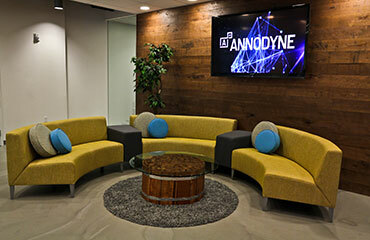 Annodyne is an experience where inspired thinkers come to create innovative solutions. Where rare ingenuity sparks ideas that no one has considered before. Where Changemakers become agents of progress.